I just wanted to tell you how much I enjoy this thread; I have learned a lot about my Dutch heritage! My father was born and raised in Rotterdam but moved to Canada (Ontario) when he was 19 to become a dairy farmer; he worked on a farm for a couple of years and eventually became a veterinarian and he and my mother moved to British Columbia after they married. He had many Dutch farmers as clients and many times I can remember him bringing fresh-baked oliebollen home (from one of the farmer's wives). Every Christmas we would get a care package from one of my aunts in Holland and of course we all loved the marzipan the best - we still talk about the year we got a big marzipan pig with eight little piglets! I decided that as part of my Christmas baking this year I was going to make the filled speculaas as a special treat for my father and it turned out very well, despite the fact that I was kind of estimating some of the measurements because I don't have a kitchen scale. I didn't find the almond taste very pronounced in the almond paste, which is probably a quality issue so next year I will either make my own or find a different brand. That being said, my father loved it (as did the rest of the family). So thank you for introducing us all to Dutch cooking (and baking!!). Now those are some great threads looks lovely Jensen! I'm glad you liked it. However, I can really see how the peas would go well with sweet pickles and what looks to be a sweet mustard (?) in your photo. The yellow stuff is piccalilly (or pickalilly), a sour/sweet pickle made from vegetables (cauliflower, green beans, carrots, pickling onions, gherkins etc) in a rather thick sauce. The yellow color comes from turmeric. I think this is originally a british pickle, but it's popular in the Netherlands to eat with bean dishes and Stamppot. Thanks for sharing your family history Minko! About the almond paste: the flavor is really not that pronounced - after all, it's just pure almonds ground, with no additional flavourings added. If you like a more pronounced flavor, you could always add few drops of almond essence. But it's also possible that you bought a paste that was not made of almonds only, sometimes other stuff is added (ground soybeans !) to make it cheaper, and that would ofcourse make it much blander! Oliebollen - with a twist. I made Oliebollen this morning. I made half the amount Klary gave in her recipe (with the increased measure of milk). Having made several dozen spring rolls last night for dinner, after cooking about 20 of these delicious morsels, I had had enough of deep frying in my hot kitchen (35 C outside today, 27 C inside). I still had a lot of batter left so I got creative, filling large muffin tins with the mixture and cooking them in the oven. The result was a very light, sweet bun. The oliebollen and the "buns" were given the "thumbs up" by my husband. baking them in muffintins is just brilliant. Thanks for the inspiration! Cadbury, what was the temperature of your oven? I'd love to try the Oliebollen, but hate the mess that deep frying makes. And Klary, I love this thread. I can't wait to try some of these dishes. Thanks for sharing it with us. 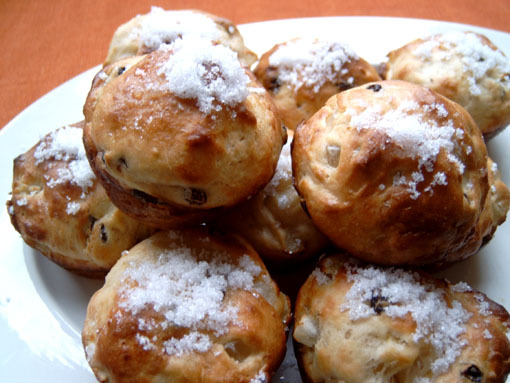 Hey, maybe you could also do them in an aebleskiver pan? That way they'd get some oil, but not so much. I'm another deepfry-ophobic, although those bitterballen and the olieballen might force me to get over that. I'm not sure that it would work too well. The mixture is really sticky and I would think it would be difficult to fill the hot pan quickly enough. Maybe you should give it a try and let us know. They are rather delicious. flavorings: about half a small apple, chopped finely, a handful of currants, a handful of candied citron. Dough was left to rise until doubled, then punched down, and left to rise again. I set my oven to about 190 C. I greased 2 6-hole muffinpans with sunfloweroil, rather liberally, so as not to take the oil comletely out of the oliebollen I heated the muffintins in the oven for a couple of minutes until the oil was hot and then filled them one at the time. Baked for about 10 minutes. I brushed them with milk when they came out of the oven, and sprinkled with soft sugar. 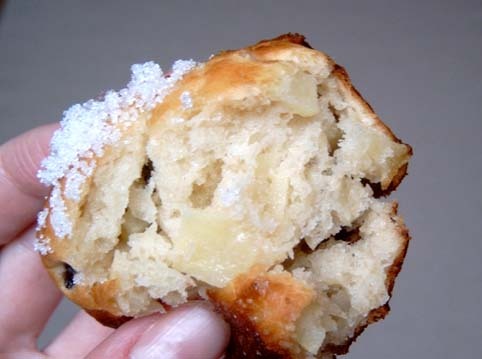 Voila.. the practically oil-less oliebol! I'm not sure what we should call this.. any ideas? They are fantastic. They are not the same as the real thing, ofcourse, because they don't have the crispy crunchy crust that you can only get from deepfrying. But they are so light, fluffy, and their taste is definitely that of the real thing! I can imagine that this is something you can make much more often, it's easy and fast, and ofcourse it's healthier. Thank you Cadbury for this creative contribution to Dutch Cooking! this will be in my repertoire from now on! What's the Dutch word for baked? So yes, bakbollen would be a good description..
Bakken actually can also be used to describe frying (like in sautepan.) Language is complicated..
Those are beautiful! Did you turn them as they baked, to achieve that round shape? Or is that a camera-angle illusion? Or is that a camera-angle illusion? I think so.. they look like muffins, with a really round and raised top. I did not turn them as they baked, I think that would have affected the rise too much. They look fantastic...I personally would call them 'bollengebakken'...but hey, my sole experience cooking dutch food is 3 months making massive amounts of Nasi Goreng in a Dutch Deli/Produce shop. I only know about 10 dutch words - and 5 of those are rather rude. I am going to do the butter braised beef this weekend...I keep having to put it off, much to my chagrin. finally made the butter braised beef(though with olive oil not butter so johnnybird could eat it). what a wonderfully simple but elegant dish. i had gotten a piece of beef from my butcher that i cut in half then cooked. we had half the meat with garlic mashed potatoes and green beans. i took the rest, cut it into smallish pieces, resurrected some beef gravy from the freezer and cooked up a some potatoes, carrots, and onions then made a truly great stew.... thanks klary! I know I already posted a picture of this somewhere upthread, but as I was making the soup on monday, I felt it was impossible not to share this with you. 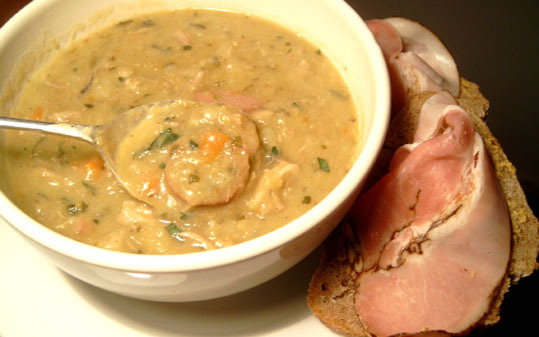 Erwtensoep is a real Dutch classic - simple, rustic winter comfortfood. Fresh pork. 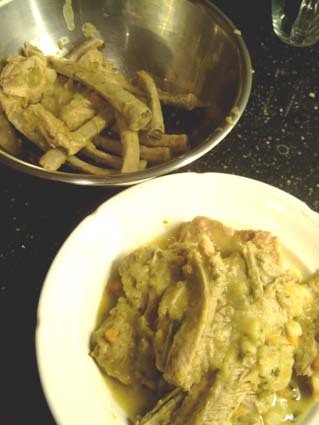 You can use various types, a hamhock, pigs feet, ribs. Here I have over a kilo of porkribs, and because I felt they were maybe not meaty enough, some extra pork shoulder, chopped up. Salt pork. A small piece of salt, not smoked pork. Smoked pork. 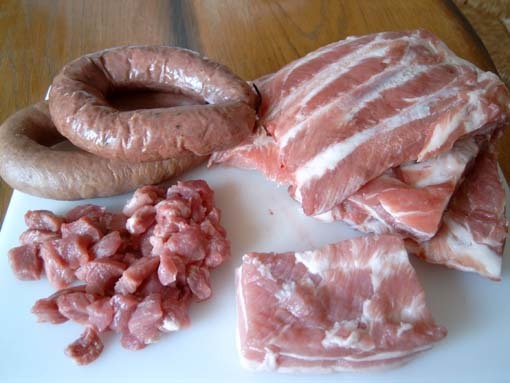 Smoked pork sausages are traditional, but bits of smoked bacon could be added as well. Vegetables. Here I have a couple of large potatoes, 2 fat leeks, 3 onions, 2 large carrots, a small celeriac, half a bunch of parsley and half a bunch of celery leaves. You don't have to be too precise about the amounts. 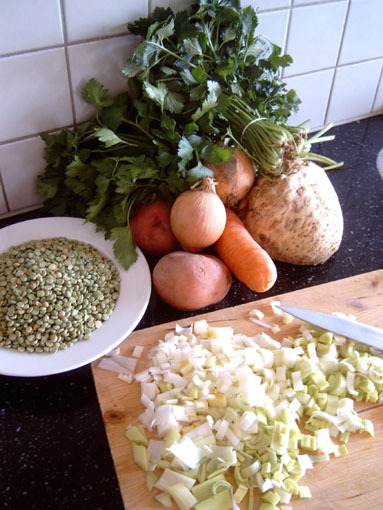 Now, a couple of points that will transform ordinary splitpea soup into the sublime Dutch snert..
- Chop up your vegetables fairly small. You want them to dissolve into the soup. 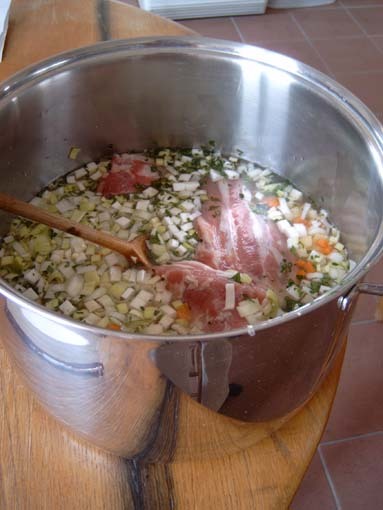 - Don't add the smoked meats until at the very end, or your soup will get a harsh and too smokey flavor. Snert is supposed to have a very mellow, sweet flavor, with the contrast of little bits of smokey meat. 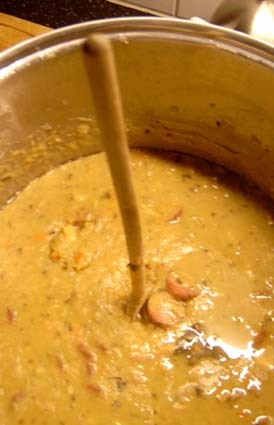 - Most recipes tell you to use 2 litres of water for 500 grams of splitpeas. This gives you a thick soup fast, but not the complex flavor you're after. So I use 4 litres of water for 500 grams of peas. I simmer the soup for 2 hours covered, and then for about 2 hours more, uncovered. 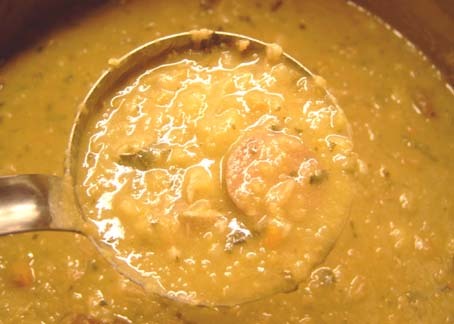 - Long, slow simmering is what gives this soup it's character. There are no shortcuts! During the latter part of the cooking, when the soup is getting thicker, it needs a lot of attention. I't burns easily and stick to the pan. You will need to stir it and scrape the pan at least every 15-20 minutes. - Don't eat it the day you made it. Really. This is going to be hard, because it smells so good, but trust me, tomorrow it will be even better. When it boils, lower the heat and make sure this is simmering slowly. Simmer for about 2 hours, stirring often. Uncover the pan and simmer for a couple more hours, stirring even more often. The house is smelling heavenly by now. Take the meat out and separate meat and bones. This should be really easy. taste it and add more salt and pepper if you think it needs it. Let it cool. As it cools, it becomes so firms that a spoon will stand up straight.. I don't know if you can see it in this picture, but the texture has changed overnight, and the soup has become even more smooth and thick. edited to add: I know this does not look pretty.. but if only you could smell it.. as we were eating it yesterday my husband said, I wish you could put this smell on the internet for those EGulleters..
No, it doesn't look lovely at all. But after all of the delicious Dutch cooking that you've iintroduced to us, we can trust you, Chufi. I can definitely see the textural change. The soup on the second day looks almost glossy. Do the leftovers freeze well? Yes, it freezes well. I put several containers in the freezer.. ready and waiting for the cold and rainy days of February. Ofcourse you could make less but it does not seem to make sense when something cooks for such a long time, to make only a small pan. As an aside, Klary, I wish I could read your blogspot blog( I can't read dutch though), the tart looks absolutly wonderful.